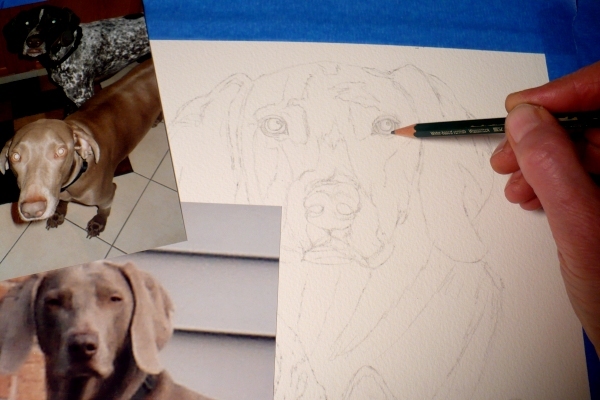 One more pet portrait to be done for Christmas! I've just completed two other portraits, oil paintings of a tabby cat and a dog, but I'll post those later as the client for this one is anxious to see how it's coming along. Fortunately, she lives locally so she can pick it up when it's finished. When beginning a portrait, I look over all the submitted images to choose the ones that will work best. This portrait will be an 11"x14" watercolor of three dogs: a German Shorthair Pointer, a Weimaraner and a Shepherd mix. This is where the pet portrait questionnaire completed by the client comes in handy. It will help me choose poses that best represent the dogs' personalities. When the poses are chosen, I crop the digital images and have them printed up at 4"x6" size. I also have the other images printed because they will be useful too. 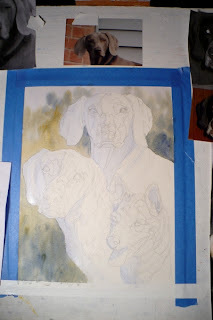 Composition is important in a painting and it's a challenge with three animals. I've found the easiest way to arrange a good composition is to print black and white images at the size I want, cut them out and arrange them on the paper until I'm satisfied with how it looks. Now, I can start the drawing, confident that the subjects will be placed well without the need to erase and start over. 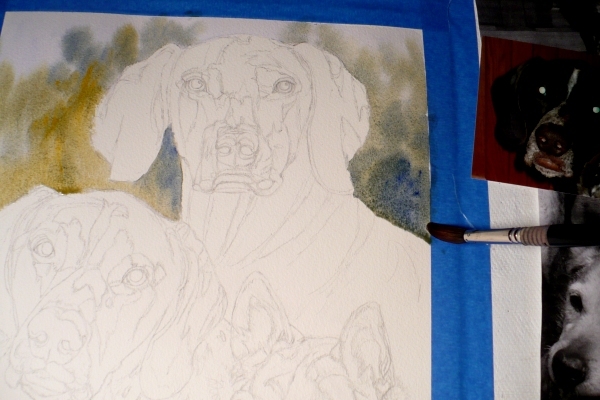 The Weimaraner at the top of the painting looks pretty with her ears forward which is why I chose that pose to use. However, she is standing in the sun which makes her squint. Fortunately, there is another photo of her with her eyes wide open. You can see it on the left. I'll use that photo to help with drawing her eyes. You'll notice that the eyes in the top photo look white due to the camera flash. I'll need to refer to the Questionnaire to be sure I paint them the right color. I draw each animal being careful to add all the small areas wherever the color changes denoting the facial planes. 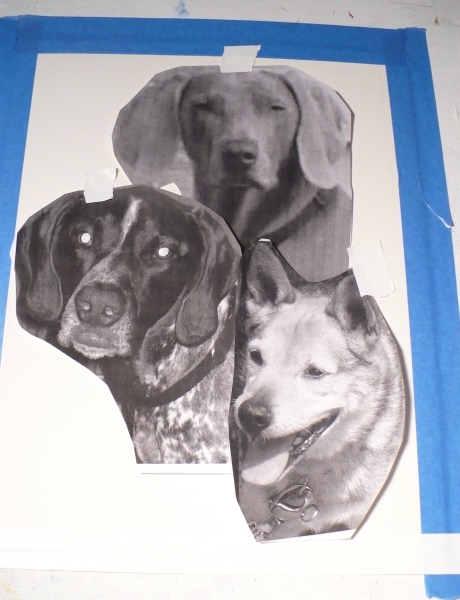 I constantly check to make sure my drawing matches up to the dog's photos - aligning the facial features correctly. This is time consuming, but it is worth it to take the time at this point. The more time I spend getting the drawing right, the more free I can be with the painting. Besides, it's much easier to make corrections at this stage than later on. Now I add the simple background which the client suggested . I wet the entire background and float some blues and greens onto the wet paper to make a soft impression of trees and grass. The next stage is to determine the light source. 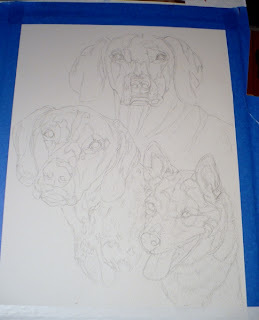 The portrait will look best if the light is coming from the same direction for all the dogs. Fortunately, when I study the photos, the light side is the same for all of them. This will make things much easier. 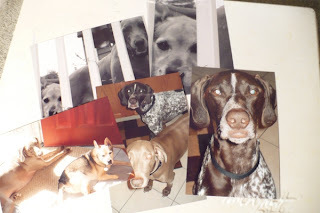 I paint a wash of blue on the shadow side of each dog. This may need to be intensified later, but for now it is fine. I'm not sure I like the sharp diagonal angle at the bottom left, so I may make a small change there later on. Click here to see the next steps in this three dog pet portrait.